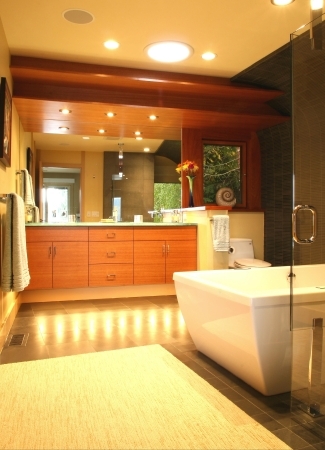 A Master Bath addition/remodel transforms a boxy, opressive existing space into a space of openness and elegance. The restriction of a close by angled setback line is transformed into a positive design feature as the addition angles gently out from the main house, and the presence of existing roof rafters dropping below ceiling planes is transformed into the curved, tiled, wall/ceiling, and into the stepped wood soffit. The shower is essentially open to the room at large by virtue of a large glass side enclosure held from above and below by custom designed chromed steel supports. A teak bench is suspended between shower walls - both functional and a gentle separation between the shower and the floor to header shower window looking out to the lake. Tile layouts on walls and floors are carefully designed and articulated and materials employed simply and cleanly for a feeling of richness and elegance.